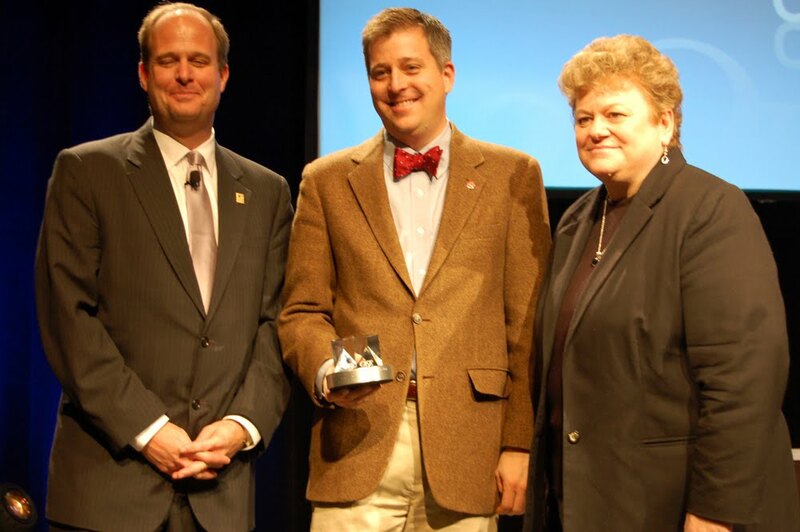 Antioch College Interim President Matthew A. Derr today accepted the CASE V Chief Executive Leadership Award for the role he played in negotiating for Antioch College’s independence and shepherding the organization in its first year of operation. Derr was nominated by Aimee Maruyama '96, a graduate of the college who today serves as director of foundation relations/senior major gifts officer; Dr. Scott Warren, an Arthur E. Morgan Fellow and a former professor of philosophy; and Dr. Richard Detweiler, president of the Great Lakes Colleges Association. CASE District V includes members from Illinois, Indiana, Michigan, Minnesota, Ohio and Wisconsin. Executive Leadership awards are an opportunity for CASE – the Council for Advancement and Support of Education – to applaud and promote the work and contributions of top educational executives. The awards recognize the president, chancellor, headmaster or system head of a CASE District V member institution for outstanding leadership and service in support of education. CASE is an international association of education advancement officers, who include alumni administrators, fund raisers, public relations managers, publications editors, and government relations officers. The ultimate goal of advancement professionals is to enhance their institutions by bringing in support — be it in the form of money, alumni loyalty, public esteem, or new students. In turn, CASE's purpose is to help these people advance the cause of education. It does this by offering information resources and training opportunities to aid its members. Derr was a member of the Antioch College Alumni Board and served on its Executive Committee. He played a key role in securing Antioch College’s independence and was the chief transition officer prior to his appointment as interim president of the college in the fall of 2009. His term as interim president ends on December 31, 2010. His successor, Mark Roosevelt, assumes the college presidency on January 1.